Kat's 9 Lives: Perfect For Movies! What can be better than to have yummy flavored popcorn while you watch a movie? My friend and I stopped by this place after a small event to grab some goodies. We went to Maw 'n Paw Kettlekorn. She bought Green Apple Licorice that was very tasty and smelled delicious. I craved for the Original Kettlekorn and got a medium bag. The prices were reasonable for the amount you get. I am still eating my kettlekorn and I gave some to my friends. 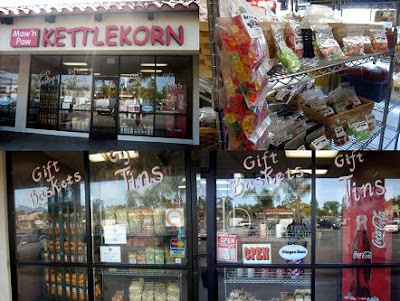 If you ever have a hankering for some sweets or munchies, be sure to stop by on Alicia Parkway to satisfy that craving! Warning that you might not stop until you finish the bag, in which case you just go back for more!